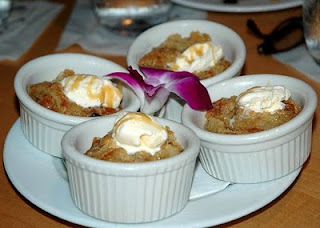 Jacksonville’s new TasteCasting team recently assembled at one of Jacksonville’s Top 25 restaurants and perennial favorite – bb’s – where we were treated to a four course tasting menu – courtesy of owners Barbara and Karin. Our host for the evening was Executive Chef Carlos Ramirez. Originally from Columbia and trained at Johnson and Wales, Chef Ramirez’ prowess in the kitchen is matched by his attentiveness to the restaurant’s clientele. He spent a great deal of time with our TasteCasting team, thoroughly describing each dish as it was presented and answering all of our questions. We were treated as honored guests, and we are grateful for the special attention paid to our group by of one of Jacksonville’s premier chefs. 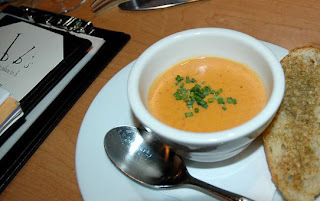 To begin our tasting we were treated to a Shrimp Bisque – creamy and sweet like shrimp fresh from the sea, with just enough heat. Next up was an assortment of salads. 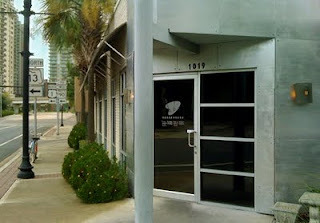 bb’s is one of Jacksonville’s power lunch spots, and their salads are a local favorite. Mediterranean Chicken Salad boasts shredded white meat of chicken on a bed of greens, with tender haricots vert, briny kalamata olives, sweet grape tomatoes, tangy, full flavored feta cheese and a bright, light lemon herb vinaigrette. Pan Asian Chop Chop Salad is a study in contrasting tastes and textures – field greens with juicy grilled chicken, macadamia nuts, pickled ginger, rice noodles, sweet soy, wasabi drizzle and sesame ginger vinaigrette. Grilled Salmon Salad reminded us of autumn – chargrilled salmon served on a bed of greens over a dried fruit and nut couscous, and topped with a dollop of pumpkinseed pesto. Field greens are tossed with sweet slivers of Medjool dates, candied walnuts and strips of Black Forest ham. Warm, tangy goat cheese is nestled in thickly sliced toasted baguette and drizzled with honey. Crispy Fried Rock Shrimp salad was dressed with tangerine cream and a lemon herb vinaigrette. The sweet little shrimp were studded with black sesame seeds. 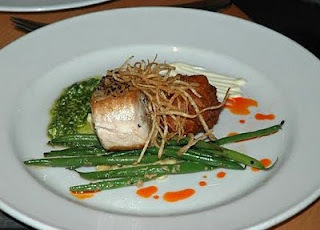 The entrees showcased a range of flavor profiles, while bringing into focus the Chef’s Latin heritage. 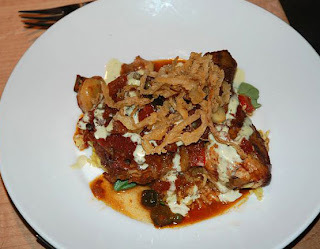 Sofrito Spiced Half Chicken was earthy and filling. Topped with fried onions and served with saffron rice pilaf, baby spinach, and drizzled with mojo infused aioli. t came with chorizo whipped potatoes, roasted plum tomato, caramelized onions and cilantro chimichurri She was quite taken with the addition of chorizo to the whipped potatoes. A simple pairing – almost instinctive – and brilliantly executed. Subtle touches like these define the bb’s experience. Grilled Wahoo was topped with parmesan-peppercorn crust and served alongside a lighter than air sweet corn and shrimp fritter and haricots verte. Arugula-lemon pesto and white truffle aioli elevated the dish to something truly memorable. , onions and zucchini, and finished with dollops of goat cheese. One benefit to tasting size portions is that we got this far and still had room for dessert! There is something for everyone in the dessert case at bb’s and sister restaurant Biscottis. There are ten to sixteen dessert selections on any given day, and the selection changes hourly. Their desserts are widely considered to be some of the best in town. Desserts like these are an obligatory indulgence. We enjoyed tasting portions of a few of the most popular selections. Dessert portions are ample, and sharing is encouraged. The Classic Carrot Cake with cream cheese frosting was a team favorite. Incredibly moist, dense and flavorful. bb’s Chocolate Truffle Cake is legendary – this taster recommends a jammy Cabernet to sip along with it. It would be easy to overlook the Croissant Bread Pudding with all the fancy cakes and tortes beckoning from behind the gleaming dessert case, but do yourself a favor and try it next time you’re there. It is worth every calorie. Our tasters kept coming back to it, even after tasting just about every offering in the dessert case! bb’s is consistently voted one of the top 25 best restaurants in Jacksonville by numerous local publications, and has received the wine spectator ‘award of excellence’ year after year. They boast an award winning wine list with over 50 wines by the glass, many $7 and under,and a full bar – they make fab martinis and mojitos! They have catering and take-out menus as well. Also worth noting is bb’s Brunch menu – served Saturdays 11am – 2pm. 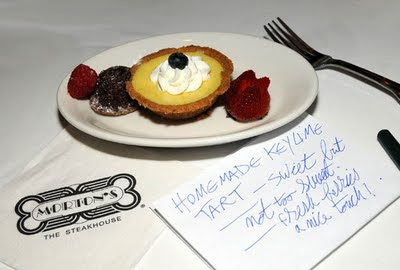 A big, warm Thank You to Barbara and Karin, the staff at bb’s, and especially Chef Carlos Ramirez. bb’s truly is a groovy place to b! Post photos courtesy of TasteCasting team members Jodi Kasten, Stacy Starling and Nancy White. Have a "Hula-Vuh" Good Time for a Worthy Cause! Seahorse Inn's outdoor bar between Atlantic Boulevard and Lemon Street in Neptune Beach. 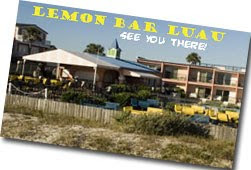 "Best of the Beaches" hors d' oeuvres, live entertainment, cash bar, a silent auction and prize drawings. Casual Attire - it's a Luau, folks! Tickets are $30 in advance or $40 at the door (if not sold out), with a special $50 ticket package that includes one regular admission and one ticket for a teacher. Major event sponsors include The Players Championship, Baptist Medical Center-Beaches and the St. Paul's Thrift Store, Scott and Becky Wiley, Eleven Atlantic, True Wealth. For ticket information call at 241-7437, ext. 1, or visit BEAM's website. 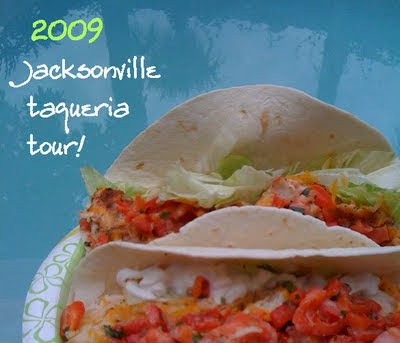 the spot widely reported to be Jacksonville's best (and most authentic) Mexican restaurant. While we don't pretend to have eaten in every single Mexican restaurant in the county, we have sampled more than the average bear, so when a claim such as this one comes along, we had to check it out! Lo and behold - what we found at Pepe's was all that AND a bag of churros! It's a fiesta. A bakery, a tienda (that's a market to us gringos), certainly a taqueria, an incidental community center. Pepe's is THE destination at Dupont Station. The tienda at Pepe's has a great selection of a variety of peppers - fresh, dried whole and ground, plus plenty of herbs and produce that you won't find at the local supermarket. Prices are great - in the market as well as the restaurant. Pepe's has a decent sized dining room, and its always bustling. 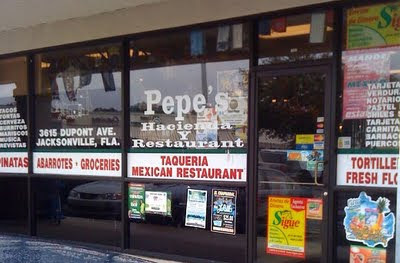 A family friendly place, Pepe's serves straight-forward Mexican favorites like Tacos and Burritos, Tortas, Enchiladas and Chiles Rellenos. My favorite are the Carnitas - tender chunks of shredded pork served on a steamed corn tortilla, garnished simply with white onion, cilantro and a squeeze of lime. 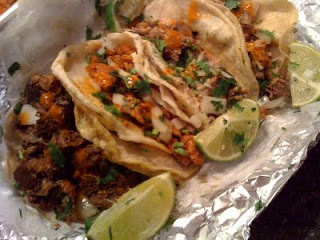 Barbacoa (beef head) has an assertive flavor, and Pastor (marinated pork) is slightly tart and not too spicy. 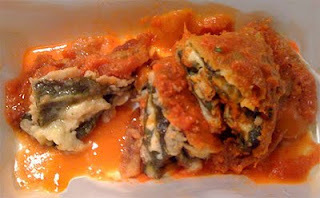 The Chiles Relleno are whole poblano peppers, stuffed with cheese, breaded and fried, then served in a red sauce. The menu calls them spicy, but really they aren't. What they are is delicious. Eggy batter gives way to a soft, slightly sweet freshly roasted pepper, and the salty tang of melted cheese. I'll never make them with Anaheim peppers again after tasting these made from poblanos. Extra sauce is served on the side so your pepper isn't too mushy when it is served. Everything we've tasted so far has been good. 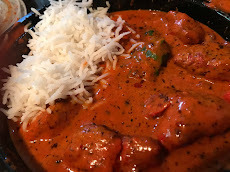 The service is friendly, the food is prepared quickly and the value is out of this world good. Tacos are just $1.75 each, and they are brimming with filling. Three for $4.99 and an Agua Fresca (flavored waters are a specialty of the house) for $2 make for a plentiful meal at less than eight dollars. 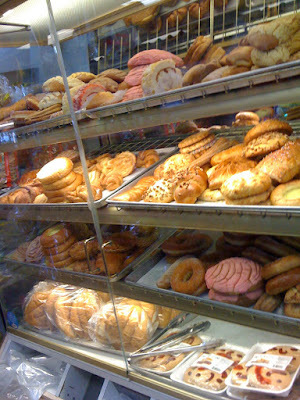 Add a Postre (dessert) like silken, creamy flan for $1.50 and you're still getting out the door for around ten dollars. We get ours to go and shop in the market while we wait. 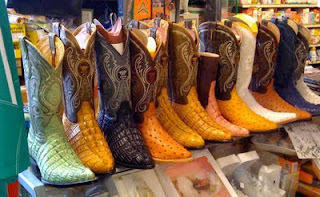 Its a great place to stock up on the staples of Mexican cooking. Warning - the smells emanating from that takeout container are enough to cause you to pull over in the nearest parking lot and "sample" everything before you can make it home. 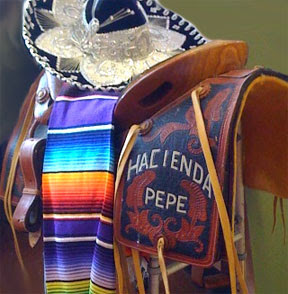 The place is always buzzing with activity - so if you are in the mood for really good, simple, authentic Mexican fare served with Latin flair, or if you're looking for something kicky to wear, hit the trail and head to Pepe's Hacienda! 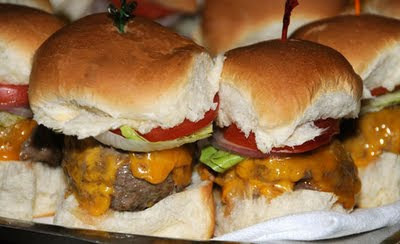 Make sure you come hungry, and bring a friend - Nancita comes to mind! 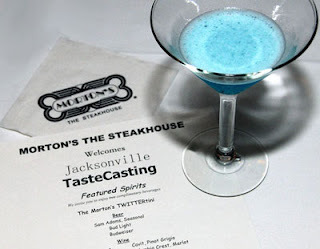 Morton's The Steakhouse generously hosted Jacksonville's first official TasteCasting event earlier this week. The result of weeks and months of behind the scenes planning and organization, the event was practically flawless - with the obvious exception that Jacksonville Team's co-leader Angela (@blogbrevity) was still winging her way back to town while we were in full-on prime beef overload. 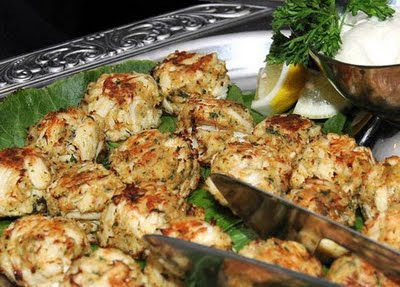 We tasted their Bar Bites - an appetizer menu consisting of classic recipes downsized and featured in the bar during "Power Hour" - Happy Hour done right! 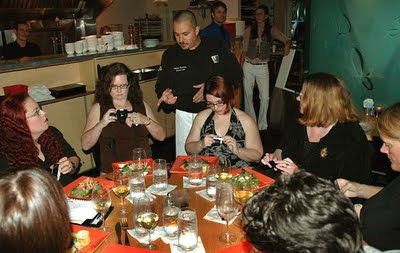 The official account of the evening is posted on the national TasteCasting blog. The fun, funky, fresh accounting of the evening took place on twitter, facebook and in several first coast blogs. Having been part of the behind the scenes planning for this event and this team, I knew what to expect from the food / service / restaurant interaction point of view. What I hadn't taken into account was how seriously cool it would be bringing all these people together. So I found myself out to dinner with fifteen people, many of whom I knew only from their profile pics. Watching them enjoy the evening and revel in one another's company was the icing on the cupcake. I shared with everyone that one of my goals as a team organizer was to force myself to have social life. At some point in the evening I looked around and realized that goal was coming to fruition. It was nice to meet and tweet with so many like-minded individuals. That was an aspect of this concept that I hadn't fully appreciated until that moment at Morton's when we were all hitting our stride, working, visiting, eating, tweeting and repeating, as TasteCasting founder Dan Harris says. Writing can be so rewarding, but at the same time it is isolating. The virtual worlds of Twitter, facebook et al are no match for the real thing. And this time, the real thing involved beef. Lots and lots of beef. And crab. And I seem to recall some heavenly Key Lime Pie. And so many fascinating people. Our TasteCasting team has grown to 29 people already, and we've only experienced one official event so far. Next week we'll meet Barbara Bredehoeft, owner of Biscotti's and bb's. She's got a tasting planned for us at Biscottis and I know it will be wonderful. Jacksonville has a vibrant food scene and I'm proud to be a part of it. Thanks to everyone for coming out to taste, and to Mary Sue and Drew at Morton's for hosting and serving us, and to St John and Partners for recommending us to them. Thanks also to photographer / fellow TasteCaster Bassel Jadaa for many of the pics in this post.